The basic hypothesis of this research was that media literacy is the basic prerequisite for establishing a society of developed democratic consciousness. At the same time, the second hypothesis appeared as a logical sequence in the title and refers to the political manipulation of subjects of political pluralism precisely on the basis of insufficient media literacy of the society itself. The third hypothesis also applies to the professionalism of the intermediaries themselves, journalists, the specific personality that exists between the public and the source of information. The mesh and mutual conditionality of the given hypothesis has also assumed the realization of scientific research based on which conclusions were drawn that shapes this work as well. Can people, and under what conditions, express their opinions, ideas and attitudes freely? The ability to think nature has given us, or how it is interpreted in a different way – God. I think, therefore I exist1. This right and freedom can not be taken away by us by any authority, even the most rigid totalitarian order. Simply, everyone can think and to shut up. The problem occurs if the thoughts that he/she thinks about – when he wants to tell that to others. For the speakers of the public word, primarily for professional journalists, it’s a question of what I can and what I can not, not to know, but to publish. Only by this act the journalist’s testimony becomes public, and the author’s responsibility for the announced word immediately follows after that. Ultimately, in all countries, best journalism would be the one in which all journalists could, and should, publish everything they know. However, such a situation rarely came to fruition. Every public speaking messenger who has tried to work in journalism has a certain experience of what he/she knew and what he/she was not able to publish. He/she knows, too, and for which he/she has abandoned the public word – whether he/she was prevented by the force of law and some authority (censorship), or was afraid to take responsibility for the consequences of his/her public word (auto-censorship). The conflict, the desire to speak publicly and the fear of the consequences of this act or the burden of responsibility derives from the fact that the right to freedom of expression of the thoughts and feelings is the natural human right. It belongs to the corpus of human rights and fundamental freedoms that are aboriginal and fundamental, such as the right for life, for freedom, to have property, to the integrity of a personality … And, in a healthy sense, such rights have always been considered undeniable. As no one has ever denied that the sun is coming up and going down, so there has been no doubt about the existence of basic human rights. But many conflicts around this notorious fact (sunrise and sunset) came about when the question arises: Why is this happening? Is it because the Earth is turning around the Sun, or vice versa. If you have given this question an answer that has opposed to the valid “truth” or dogma, you could have been, because of the given public opinion, end up at the bonfire. Thus, the enjoyment of fundamental human rights and freedoms have been discussed, but also opened, a multitude of disputes and dilemmas when asked the question: Under what conditions can they enjoy it and if there are limits beyond which they can not be practiced? Responses to these questions were of particular importance to the journalistic profession because, in the nature of their work, it was focused on public insight, ie. public opinion. The audience in most cases blindly trusts media, ie, journalists, and many “reporters” report on what they heard from others, and publish untruthful information. As journalists, we always have to ask: are the facts presented true and how can we interpret them (why something happened, what are the causes and what will be the consequences of it)? The basic rule of journalistic profession requires that the publicly announced facts be objective, but permits their interpretation to be different. In the professional jargon of journalism, this is the rule to differently creates presumptions of the creations for the information that are presented, but also differently be responsible for the news and opinion, commentary. And again, as in the past, due to some interpretation of the facts, journalists will be “rewarded” and because of different facts, criticized and even punished. The media have tremendous power. What it’s suppressed or overlooked, as if it did not happen. What they emphasize or repeat, as if it were the most important in our lives. Hence, it is socially and democratically justified to have journalists, due to the proportionately high power they possess, journalists and the media simultaneously undergo greater responsibility. The Doctrine of Social Responsibility of Media and Journalists starts from the good faith that abuse through public words will not come. It also confirms that the boundaries of media freedom must exist. However, this was not the most important issue with regard to the responsibility of journalists in practice, which is: who and how it makes the boundaries of the press freedom, that is, all the media sui generis? Journalistic independence is not, as stated in the book “Elements of Journalism3” of the authors: Bill Kovach and Tom Rosentiel, an neutrality. While the words of editors and commentators are not neutral, the source of their credibility is their accuracy, intellectual justice, and the ability to inform them of their attachment to a particular group or result of the very consequences of their work. However, professional journalists, those who respect professional ethical standards, must avoid to wander into arrogance, elitism, isolation or nihilism when implementing their own form of independence. At the same time, without integrity, journalism is suspicious and unreliable, and can not be trusted within its appearance. Integrity gives the reporter the authority to investigate questions, “cast light” on “dark places” and to dig up where others will not. As mentioned earlier, information aimed for the development of a democratic society of different subjects of political pluralism, it is of the utmost importance that a concrete public debate on matters of importance to society is settled on the basis of reliable solid professional journalism. Professional ethical standards must stimulate moral imagination, recognize behavioral rules in ethical issues, and direct the subjects of political pluralism to work on the development of analytic abilities, as well as work on acquiring the sense of moral obligation and personal responsibility with the expressed tolerance on disagreement, that is, with a simple vocabulary said – it must work on acquiring an ethical condition. Most of all because ethics is the branch of philosophy that deals with moral behavior issues. Lawyers and judges tell us that the laws are within the foundation of our civilization. They are not right and that is not true, and here I emphasize that – The foundations of our culture(s) lies in moral respect for the laws. What is the function of the media in the system of professional ethical standards? Mass media are among the most influential companies in a democratic society (especially social networks in XXI Century), at the crossroads between citizens and their political, economic and social institutions. How can we overcome the problems faced by journalism when faced with a situation of overwhelming social networks? Rumor problems, manipulation of disinformation, lies, deception and hypocrisy of politicians who are even ready to change the laws if it suits them personally or in other words – to adapt legislation to their own interests and thus directly or indirectly usurp all the possibilities for forming a deliberative society democracy which may be the only outlet not only for the local areas of South East Europe, but also for the wider, global meaning of that word4. At the same time, how to be ethical in society, where no matter what political option they belong to, the principle exists “in a society where everybody steals, nobody steals”6? There are a number of questions that I will try to give appropriate answers during 2018 on the pages of Eurasia Review, but the success of theoretical reflections is verifiable only in practice where there will be ethics in journalism that will be focused, universal, common good, and not merely to an individual benefit per se. Today, the truth is an integral part of professional ethical standards, honesty (objectivity), impartiality, appropriate relationships with sources of information, respect for persons who are subject to information, elimination of any discrimination and journalist’s responsibility. However, in the world of global sin in which we are living, we are still so far away from that. Aren’t we? These essays started on 14.2.2018 on the pages of Eurasia Review are the part of the book “Media literacy vs. political manipulations“ – author Assoc. 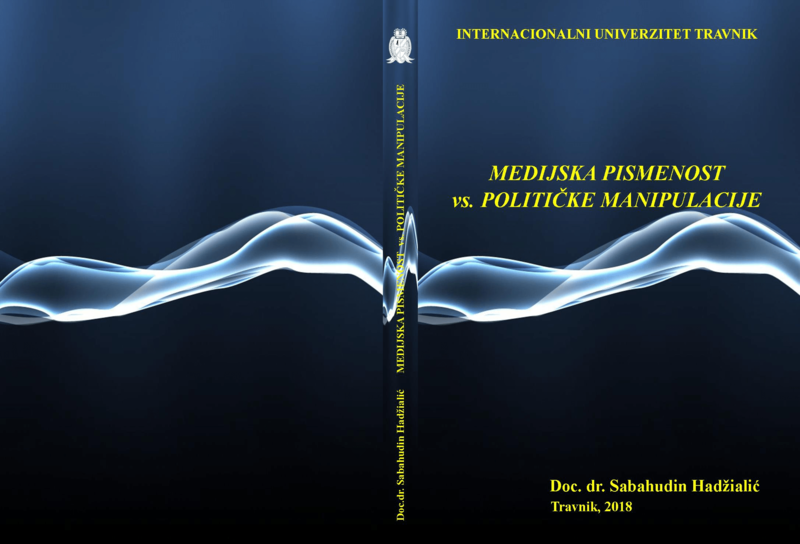 Prof. Dr. and Dr Honoris Causa Sabahudin Hadžialić – published by International University Travnik, 2018, in Travnik, Bosnia and Herzegovina (and the book will be promoted first at this University on 31.3.2018 at the hall 11 – 3rd floor at 2 p.m. together with the book “World as Global Sin“ about which Eurasia Review already wrote about on 12.1.2018: https://www.eurasiareview.com/12012018-155335/ ).